An online slots player known as ‘CleaningLady’ has cleaned up at Slotastic casino after an incredible winning streak. The other night, she deposited $65 and before the evening was over walked away with nearly a quarter of a million dollars. A regular player at Slotastic for some time now, Susan S. is an assistant manager at a deli. After she played her initial deposit up to $6000 she requested a withdrawal. She decided to continue playing and, minutes later, cancelled her withdrawal. Susan soon had a nice $11,835 hit on the Golden Retriever online slot machine which prompted her to increase her bet. After a lot of Free Game Features on Hidden Riches, Crazy Vegas, Texan Tycoon and BigShot she hit a feature on Loose Caboose that paid out $66,100. CleaningLady’s total winnings for the evening were nearly $250,000. 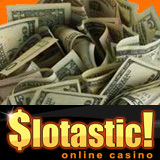 Slotastic, a full-featured online casino that focuses on slots games and special promotional offers for slots players, has more than 300 games provided by Real Time Gaming (RTG) including million dollar progressive jackpots such as Jackpot Piñatas, Caribbean Hold´em, Mid-Life Crisis, Shopping Spree and Aztec’s Millions. Slotastic welcomes players from around the world.